Each year, upwards of 1 trillion gallons of water are wasted due to leaks in homes across the United States. On average, each American home loses more than 11,000 gallons of water from dripping faucets, running toilets, and other common household leaks. That’s enough water to fill a backyard swimming pool! 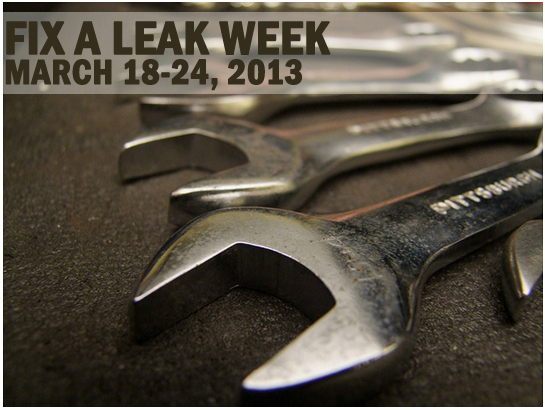 In order to spread awareness about how a common leak can lead to severe water loss, the U.S. EPA, the voluntary program called WaterSense, and their many partners are teaming up for the fifth annual Fix a Leak Week, happening this year from March 18th -24th. If you think your toilet may be leaking, put a few drops of food coloring in the tank, watch for a few minutes, and if the color shows up in the bowl then you have a leak! Toilet leaks can cause your house to lose over 100 gallons a week. If you think your dishwasher or washing machine may be leaking, check for stains or drips underneath and behind the appliance. Immediately replace broken sprinkler system heads in order to prevent leaks in your sprinkler system. Check faucets and showerheads for signs of leaks by placing a bowl under the fixture and checking for any water accumulation. GIS mapping, which more clearly identifies areas prone to repetitive leaks by reviewing historical leak information in specific areas. Master meters, available in some regions, are used to measure the water use in a specific area on a periodic basis. When a system experiences a higher than expected water flow in the middle of the night, it can be identified as a spot to investigate for onsite leak detection. This reduces the need to dispatch leak detection specialists into areas that are relatively leak-free. This is a common practice used in Europe, but is just beginning to be utilized in the U.S. Leak detection by water utilities involves trained technicians and specialized equipment, but it’s important to remember that all of us can be “water sleuths” at home. Whether it’s in your own home, or affecting the vast water delivery infrastructure across the country, if we work together we can cut down on water loss and ensure sustainable water systems for generations to come.